Webkit, the engine of Chromium. 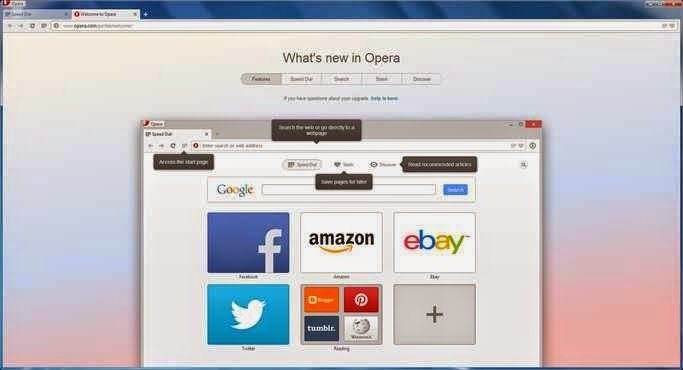 Do not waste time to download Opera! Although this change does not influence the appearance, the interface has undergone some changes that have made visually like Chrome. The browser lost the side menus and the zoom bar. He also lost part of managing tabs, something that was created by Opera. In this item, the changes have been profound: it is no longer possible to add or fix tabs, a feature that is common even in the Google browser. But software sinned much more than a few items in the interface, as its biggest differentiator decreased quality: the customization features. In the new version is simply impossible to change the look of the application. Now there is only the address bar. In it, the user can enter addresses and search terms that the application does the rest. Besides all, he brings a new download manager. Among the most noticeable improvements in the program are the new Speed ​​Dial page, "Stash" and "Discover". There are three options that are displayed on a page on first launch the browser. There, the user can quickly access favorite sites and find new sites to visit. If one has many sites on Speed ​​Dial, there is now a search bar to find them quickly. The new Speed ​​Dial page shows a Google search bar and buttons with shortcuts to the user to have faster access to your favorite websites. Are buttons with icons for websites that they access most frequently. By default, the page comes with shortcuts to Facebook and many other online services. Each shortcut can be deleted, changed or updated. The application now supports folders to better organize your shortcuts. To create a folder, just drag an icon on top of another, as is already done in Android or iOS, and the Web sites are grouped. The browser also brings a "Stash" page, where you can find screenshots of website pages that one scored by clicking the heart icon in the upper right corner of the address bar. In practice, this feature works as a Favorites menu and a list of things to read later. It is a marker of screenshots of bookmarked pages. With it, you can select news, articles and other publications of interest and see when you have enough time to read. Have our "Discover" allows you to filter and discover new content. She has several predefined themes related content and works similarly to the way common RSS feeds. In any of the three pages, when you have a lot of information, there is the possibility to use the search and look for keywords. Optimizing pages on slow connections or "Off-Road Mode"
Even with the current connection options and with the internet becoming faster and cheaper, there are still places where not everyone has access considered "broadband". To help these people, the new browser has a feature that optimizes pages on slow connections. It works by compressing the pages accessed to make browsing faster. This functionality, however, already exists in the various browser versions. But now she changed her name and is called "Off-Road Mode". Very worth the download Opera!